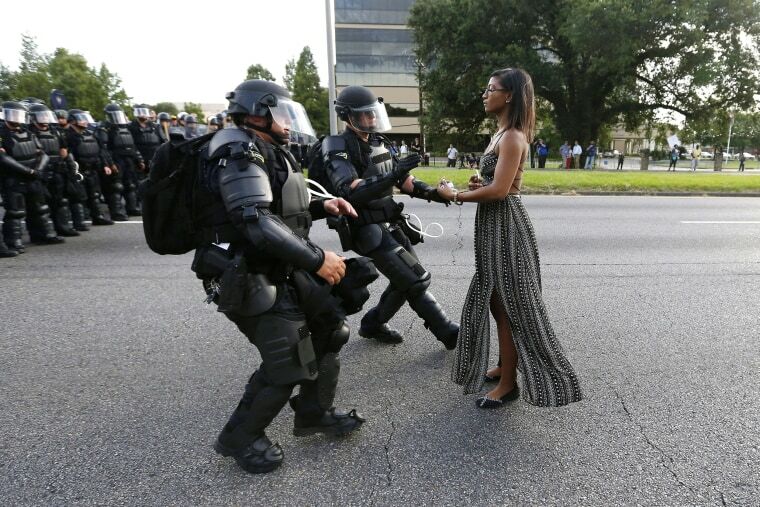 Protester Ieshia Evans is detained by law enforcement on July 9 near the headquarters of the Baton Rouge Police Department during protests over the fatal police shooting of Alton Sterling in Baton Rouge, Louisiana. Sterling's death, followed by the fatal shooting of another black man, Philando Castile, 32, near St. Paul, Minnesota, revived a wave of protests in recent years over police treatment of minorities that has given rise to the Black Lives Matter movement. 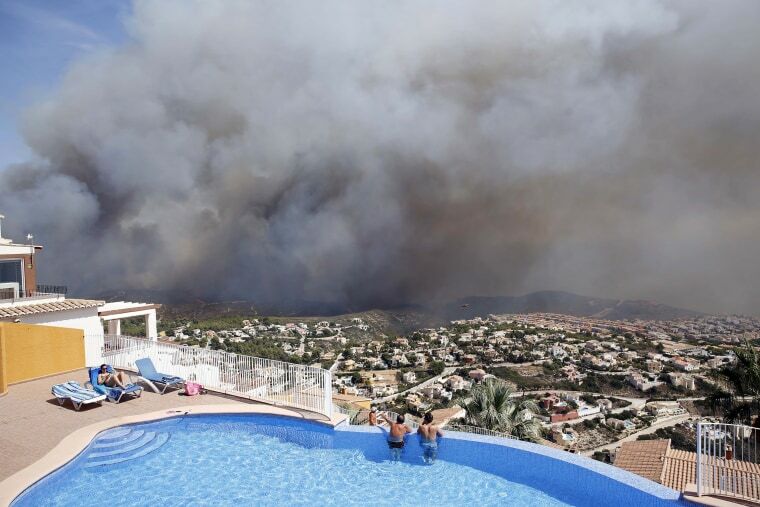 Two men look at a wildfire from a swimming pool as it burns near Benitachel village, Spain on Sept. 5. Spanish firefighters supported by two dozen water-dropping aircraft worked in temperatures of around 104 Fahrenheit to try and control a forest blaze that forced the evacuation of around 1,000 people. 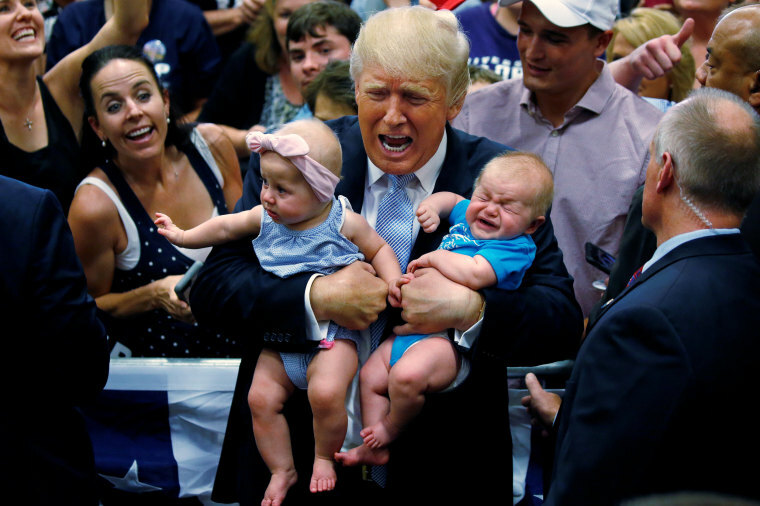 Republican presidential nominee Donald Trump holds babies at a campaign rally in Colorado Springs, Colorado on July 29. 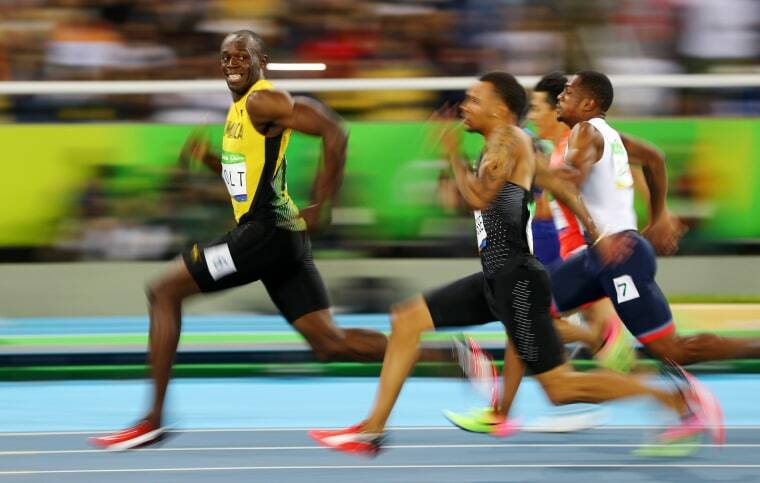 Usain Bolt of Jamaica turns to look at Andre De Grasse of Canada as they compete in the Men's 100m Semifinals at the 2016 Rio Olympics in Brazil on Aug. 14. With three Olympic gold medals in both the 100m and 200m, Bolt became the third athlete in Olympic history to win two individual events at three Olympics, joining Michael Phelps and Ray Ewry. 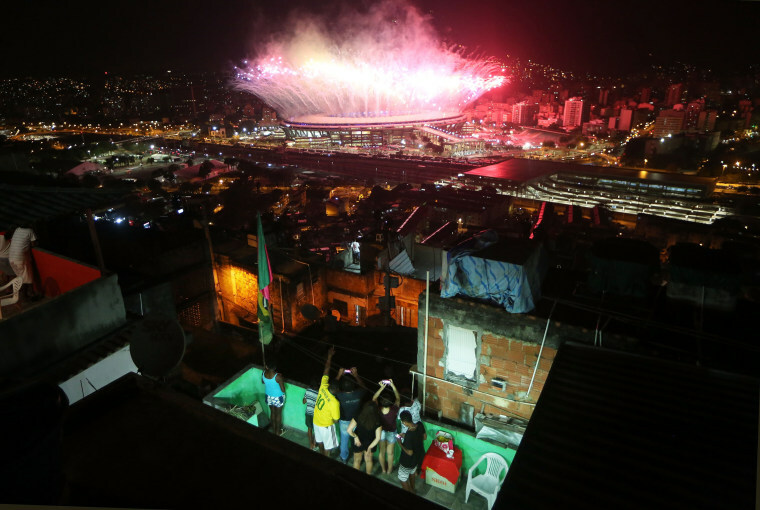 Residents of the Mangueira favela watch fireworks explode over Maracana stadium during the opening ceremonies of the 2016 Summer Olympics in Rio de Janeiro on Aug. 5. 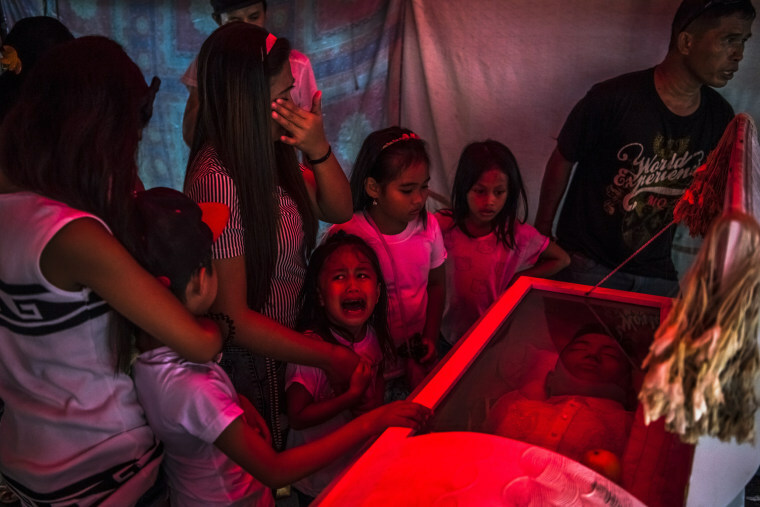 Jimji, 6, cries out in anguish, saying "Papa" as workers move the body of her father, Jimboy Bolasa, 25, for burial, in Manila, Philippines on Oct. 9. 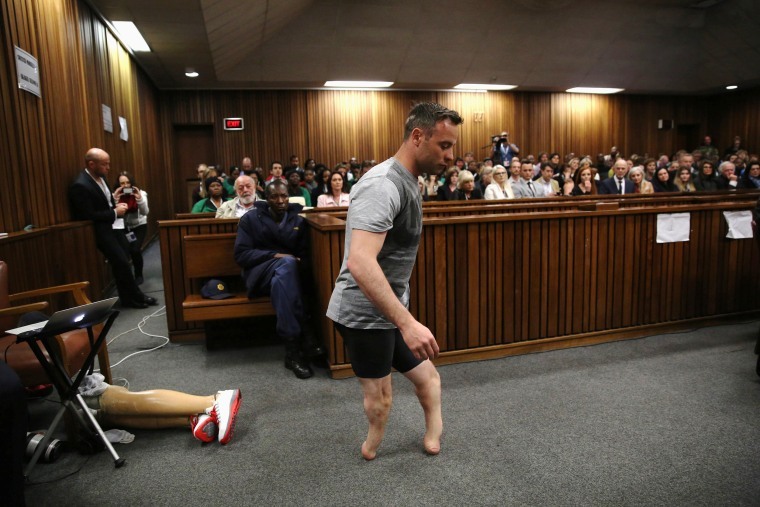 Bolasa was found murdered along with his neighbor. A bloody and chaotic campaign against drugs that President Rodrigo Duterte began when he took office on June 30 has seen about 2,000 people slain at the hands of the police alone. 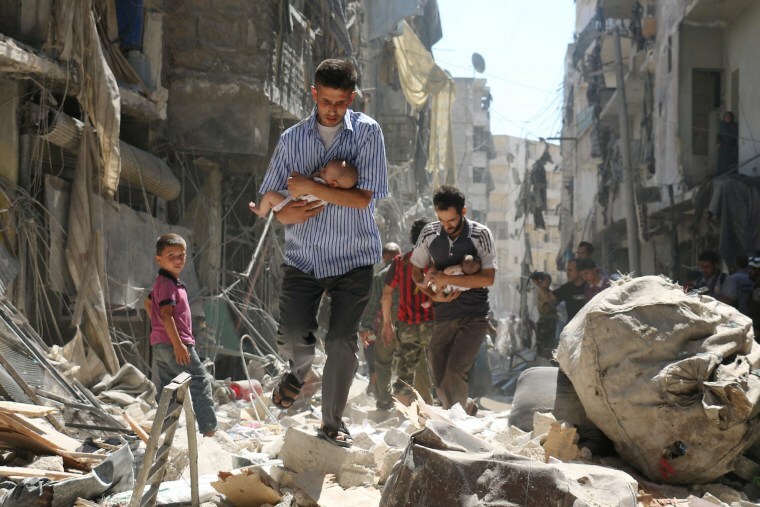 Syrian men carrying babies make their way through the rubble of destroyed buildings following a reported air strike on the rebel-held Salihin neighborhood of the northern city of Aleppo, on Sept. 11. 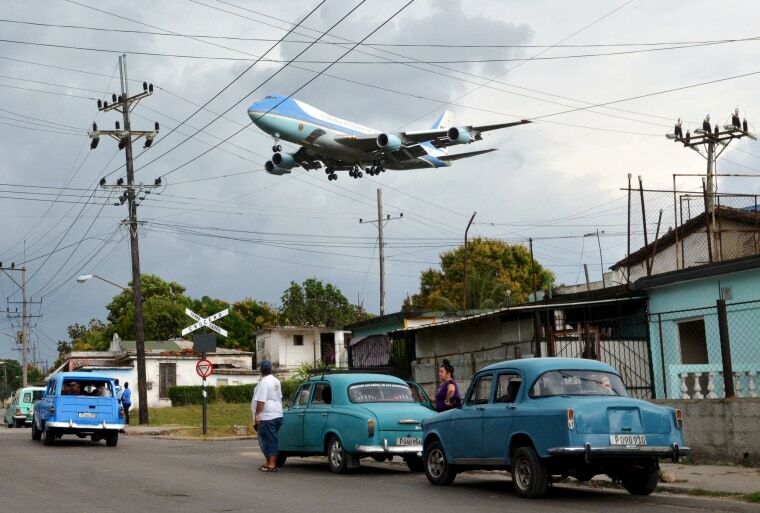 Air Force One carrying President Barack Obama and his family flies over a Havana neighborhood as it approaches the runway to land at Havana's international airport, on March 20. Obama made history by being the first sitting U.S. president to visit Cuba since Calvin Coolidge in 1928. Republican presidential candidate Donald Trump speaks to an overflow crowd during a campaign rally on Sept. 6 in Greenville, N.C.
Mourners hold a banner reading "We Love You Muhammad" as one touches the hearse carrying the body of the late boxing champion Muhammad Ali during his funeral procession through Louisville, Kentucky on June 10. 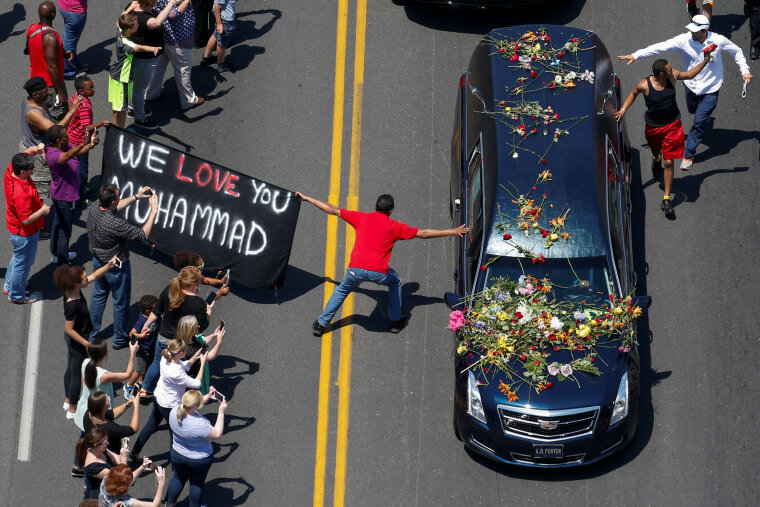 Louisville and the rest of the world said goodbye to The Greatest, showering affection during a fist-pumping funeral procession through the streets of his hometown. Ali was saluted as a brash, self-confident and fearless man of principle, someone who went from one of the most polarizing figures in America to one of the most beloved. The boxing great died on June 3 at age 74 after a long battle with Parkinson's disease. A fan knocks down a bat thrown into the stands by the Pirates' Danny Ortiz during a spring training game against the Braves on March 5 at Champion Stadium in Lake Buena Vista, Florida. 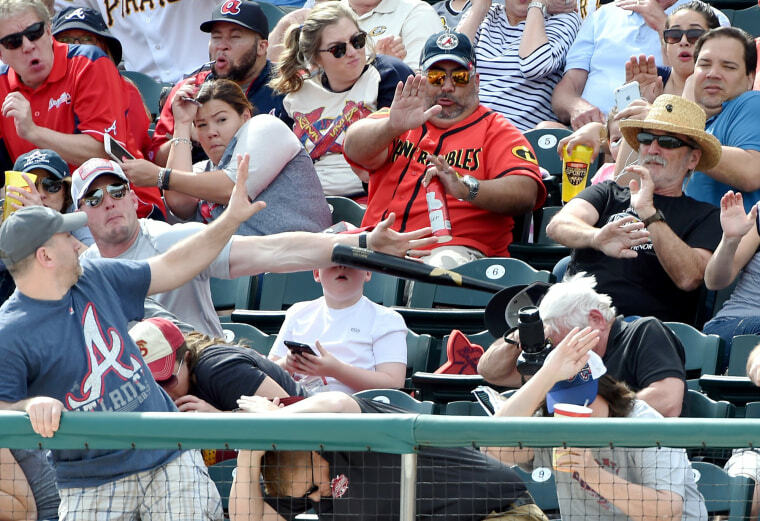 A boy at a baseball game was nearly struck in the face by the bat after it slipped from the player's grip and went whizzing through the air. 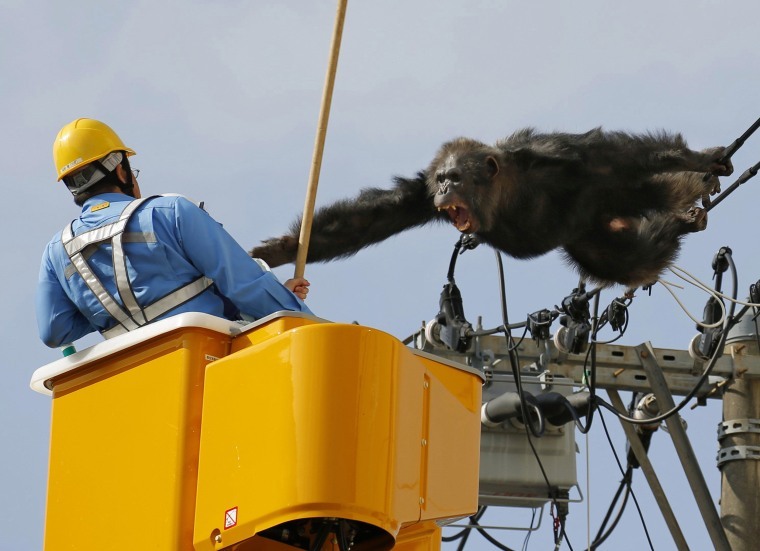 Chacha, a male chimp, screams at a worker in Sendai, northern Japan on April 14, after fleeing from a zoo and trying to avoid capture by climbing an electric pole. Chacha was on the loose nearly two hours before he was sedated and returned to the Yagiyama Zoological Park. 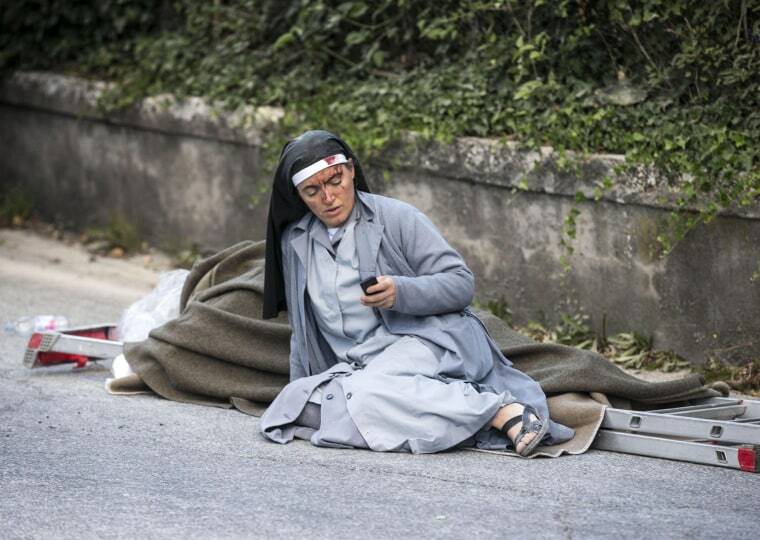 Sister Mariana, a 32-year-old from Albania, checks her mobile phone as she lies near a victim following an earthquake in Amatrice, Italy, on Aug. 24. Several elderly women were enjoying a reprieve from the summer heat in care of nuns in a convent in Amatrice, a medieval hilltop town. When the quake struck, half of the convent collapsed, apparently killing three nuns and four elderly women. Sister Mariana was one of three nuns and an elderly woman who survived because they were in a part of the convent that was not fully destroyed. Rescue teams search rubble in the destroyed Lazio mountain village of Amatrice, Italy, on Sept. 1. 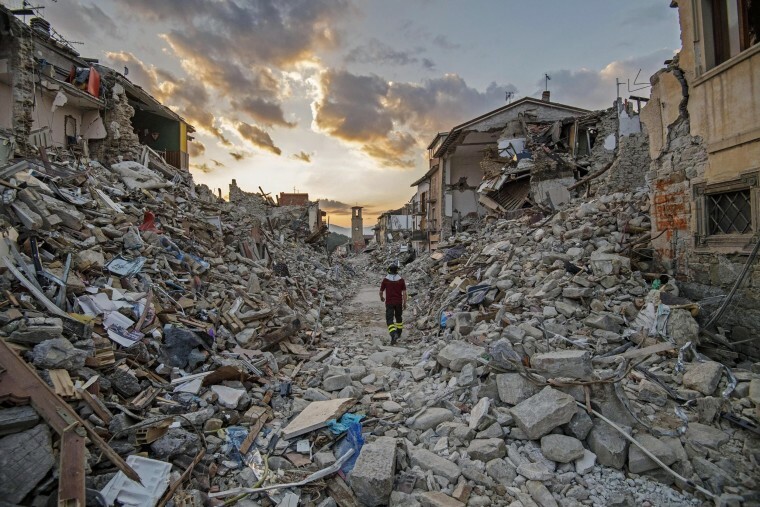 The devastating 6.2 magnitude earthquake struck central Italy on Aug. 24, killing 292 people. 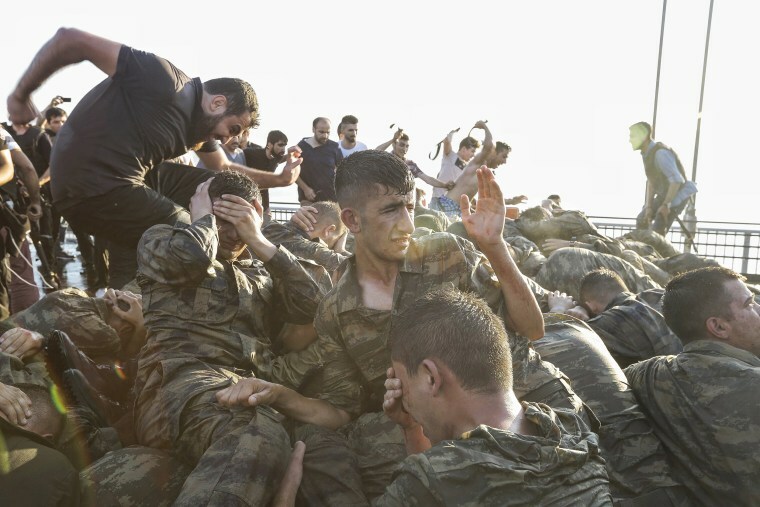 Soldiers involved in a failed coup attempt to surrender on the Bosphorus Bridge on July 16 in Istanbul. The military coup attempt began late July 15 with tanks rolling into the streets of the capital, Ankara, and Istanbul as Recep Tayyip Erdogan was enjoying a seaside vacation. Explosions and gunfire erupted throughout the night. After the failed coup that left at least 270 people dead, the Turkish government declared a state of emergency and launched a massive crackdown against supporters of the movement led by U.S.-based Islamic cleric Fethullah Gulen, whom Ankara deemed responsible for the uprising. Gulen denies any involvement. 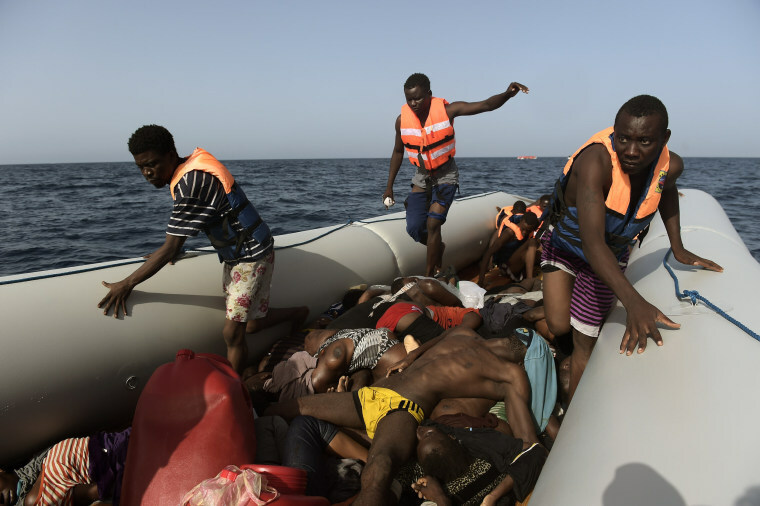 Migrants, most of them from Eritrea, jump into the water from a crowded wooden boat as they are rescued from the Mediterranean about 13 miles north of Sabratha, Libya, on Aug. 29. 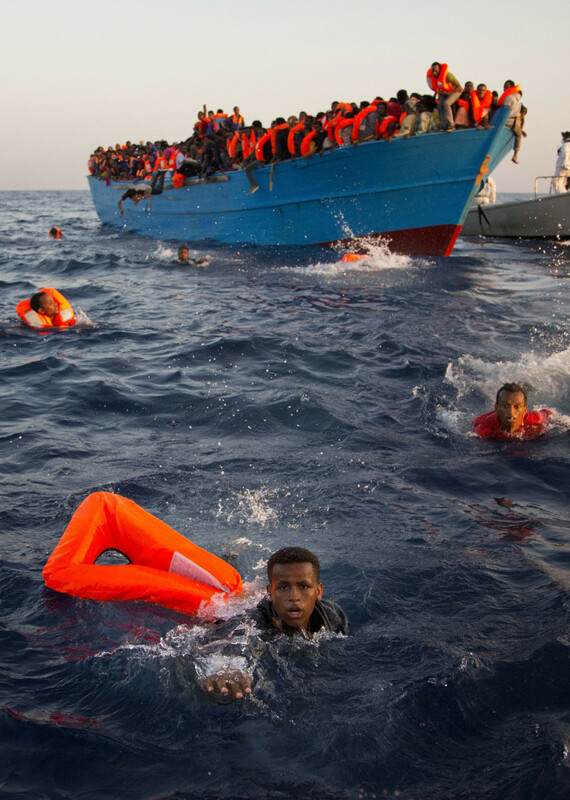 Thousands of migrants were rescued from over 20 boats by members of Proactiva Open Arms NGO before getting transferred the Italian coast guard and other NGO vessels operating in the area. 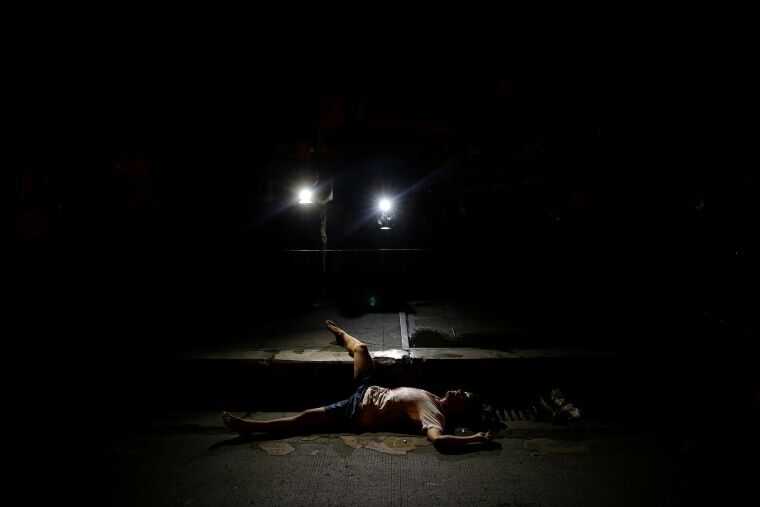 The body of a man killed by unknown gunmen is lit by lights from TV cameras in Manila, Philippines early on Oct. 24. Since taking office in June, President Rodrigo Duterte has obsessively overseen the crackdown on illegal drugs that has left more than 6,000 people dead. Philippine government officials have defended police actions during the crackdown, and the president has met past such calls with angry tirades. Children from the Suri tribe stand in Ethiopia's southern Omo Valley near Kibbish on Sept. 25. The Suri are a pastoralist Nilotic ethnic group in Ethiopia. The construction of the Gibe 3 dam, the third largest hydroelectric plant in Africa, and large areas of very "thirsty" cotton and sugar plantations and factories along the Omo river threaten the lives of tribes living in the Omo Valley who depend on the river for their survival and way of life. Human rights groups fear for the future of the tribes if they are forced to scatter, give up traditional ways through loss of land or ability to keep cattle as globalization and development increases. Ethiopia aims to produce 15,000 megawatts of electricity through its dams in the coming five years. 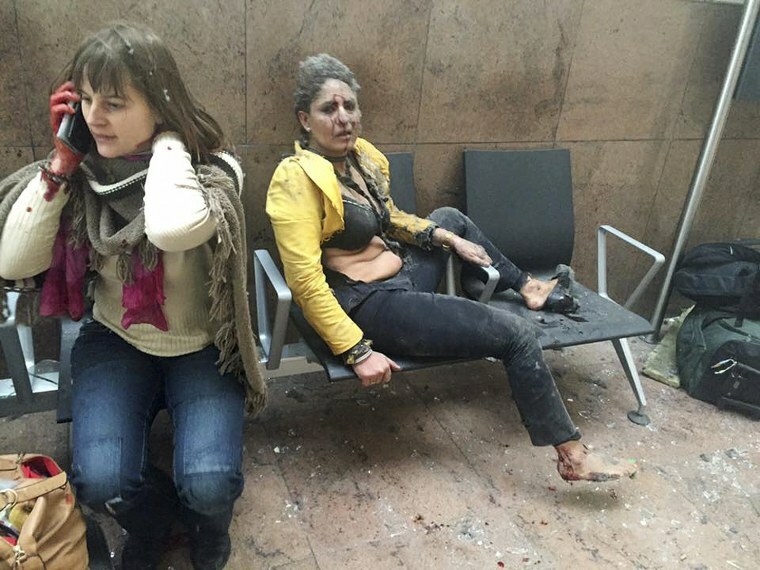 Nidhi Chaphekar, right, a 40-year-old Jet Airways flight attendant and mother of two from Mumbai, sits stunned with another unidentified woman wounded after explosions rocked Brussels Airport on March 22. Chaphekar's yellow uniform was apparently shredded from the force of one of the blasts. Islamic extremists struck in the heart of Europe, killing at least 34 people and wounding scores of others in back-to-back bombings of the Brussels airport and subway that again laid bare the continent's vulnerability to suicide squads. 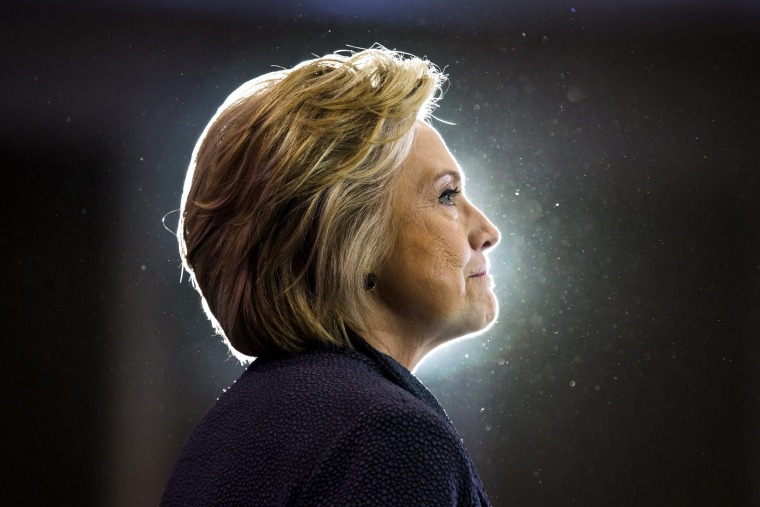 Democratic presidential nominee Hillary Clinton speaks at the Black Women's Agenda Symposium Workshop in Washington, D.C. on Sept. 16 after returning to the campaign trail after taking time off to recover from a bout of pneumonia. 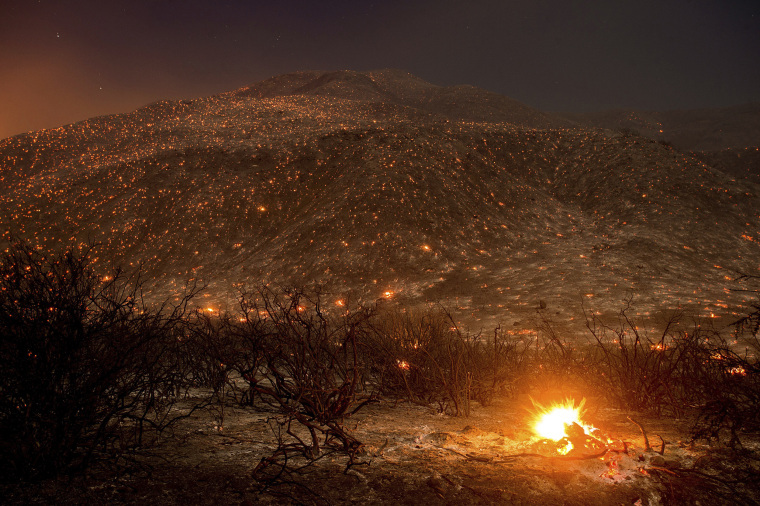 Embers from a wildfire smolder along Lytle Creek Road near Keenbrook, Calif., on Aug. 17. An explosive wildfire drove thousands from their homes as the fast moving and erratic blaze burned nearly 58 square miles in Southern California. 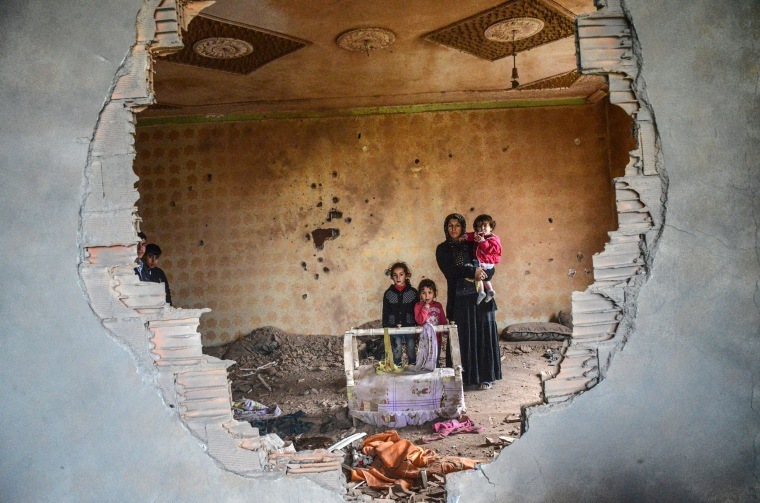 A woman and her children stand in the ruins of battle-damaged house in the Kurdish town of Silopi, in southeastern Turkey, near the border with Iraq on Jan. 19. Turkey waged an all-out offensive against the separatist Kurdistan Workers' Party, with military operations backed by curfews aimed at flushing out rebels from several southeastern urban centers. 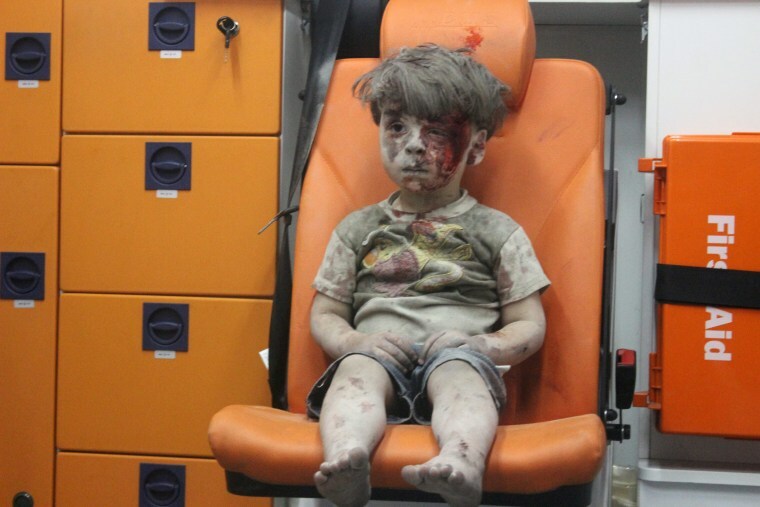 Omran Daqneesh, 5, sits in an ambulance after being pulled out of a building hit by an airstrike in Aleppo, Syria, on Aug. 17. The White Helmets were among the crowd of first responders who pulled Daqneesh and his family from the rubble of their apartment building. 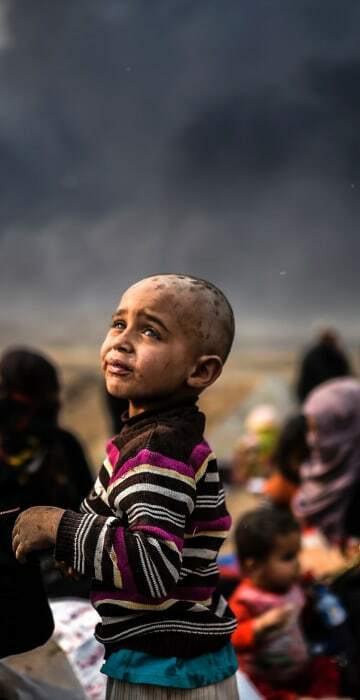 The image of the stunned and weary-looking boy encapsulated the horrors inflicted on the war-ravaged northern city and was widely shared on social media. 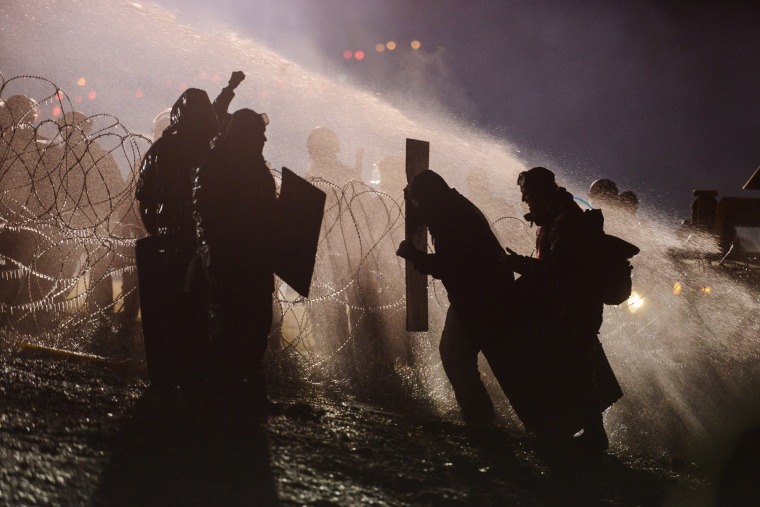 Police use water cannons on demonstrators during a protest against plans to pass the Dakota Access pipeline near the Standing Rock Indian Reservation, near Cannon Ball, North Dakota on Nov. 20. Since August, the camp on federal land near the reservation and the pipeline route has been home to thousands of people protesting the four-state $3.8 billion pipeline designed to carry oil to a shipping point in Illinois. The tribe argues that the pipeline would impact drinking water and sacred sites on its 2.3-million acre reservation straddling the North Dakota-South Dakota border. A federal court battle over whether the developer of the Dakota Access oil pipeline can finish the $3.8 billion project will linger at least into the first couple months of the new year. 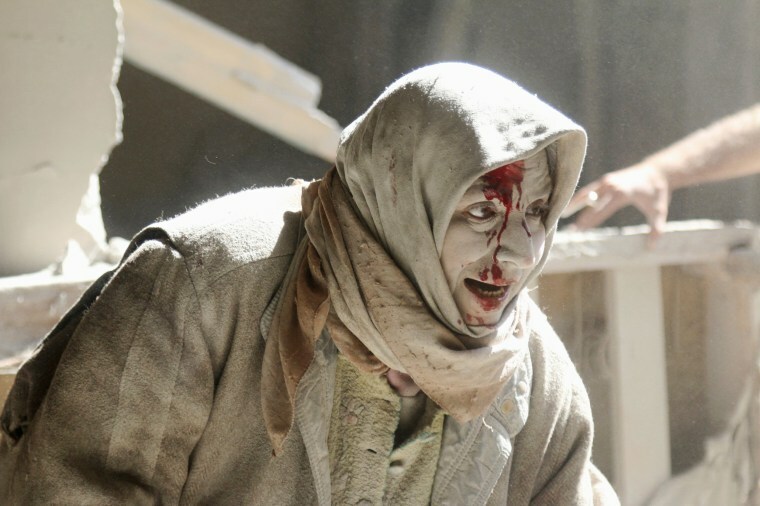 Dust covers a woman injured in airstrikes in the rebel held area of Old Aleppo, Syria on April 28 during a wave of strikes and shelling that killed more than 60 people in less than 24 hours in the besieged Syrian city. 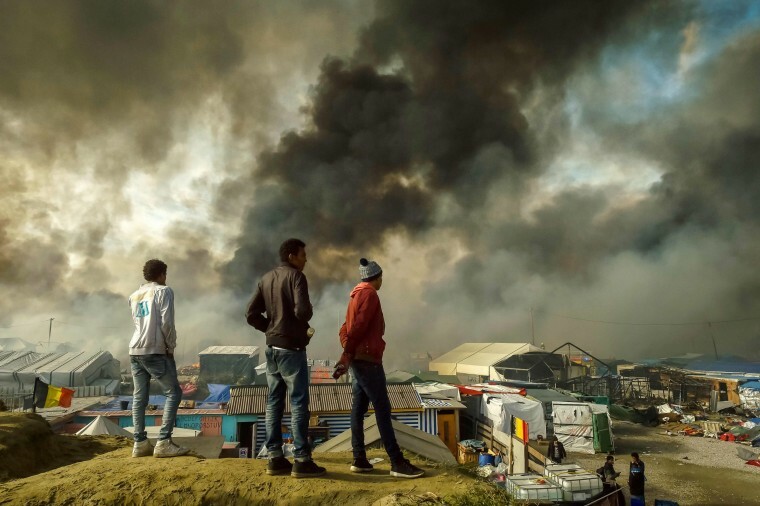 Migrants stand on a hill overlooking "The Jungle" as smoke rises from the migrant camp in Calais, France on Oct. 26. France began the mass evacuation of the makeshift migrant camp, a mammoth project to erase the humanitarian blight on its northern border, where thousands fleeing war or poverty have lived in squalor, most hoping to sneak into Britain. 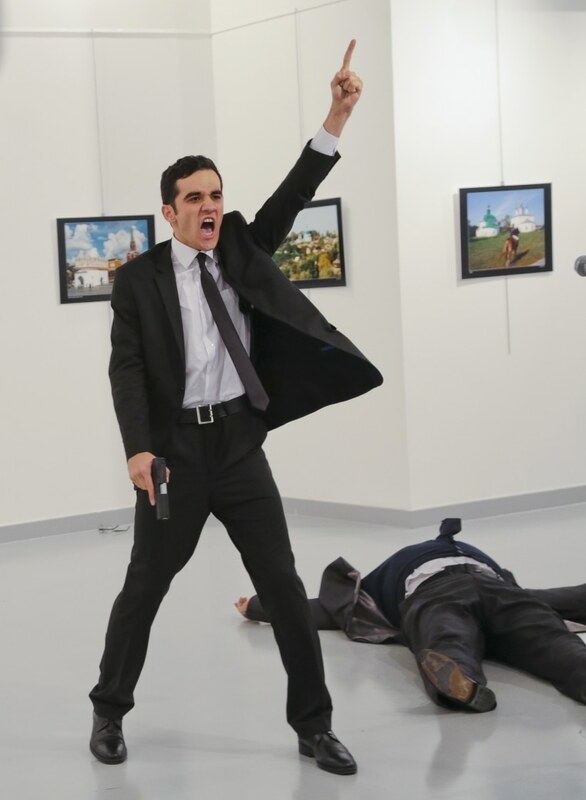 A gunman shouts after shooting the Russian Ambassador to Turkey, Andrei Karlov, at a photo gallery in Ankara on Dec. 19. A Turkish policeman fatally shot Russia's ambassador to Turkey on Monday in front of a shocked gathering at a photo exhibit and then, pacing near the body of his victim, appeared to condemn Russia's military role in Syria, shouting: "Don't forget Aleppo! Don't forget Syria!" The assailant, who was identified as Mevlut Mert Altintas, a 22-year-old member of Ankara's riot police squad, was later killed in a shootout with police. Asal Ahmed, 4, is carried by her father at the scene of a massive suicide truck bomb attack in Karada, Iraq on July 9. 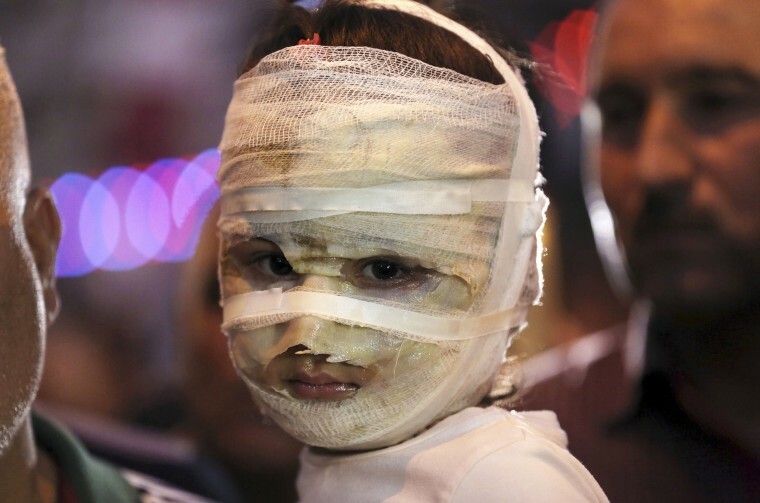 Asal and her mother were badly burned as they shopped for the Muslim holiday of Eid al-Fitr. 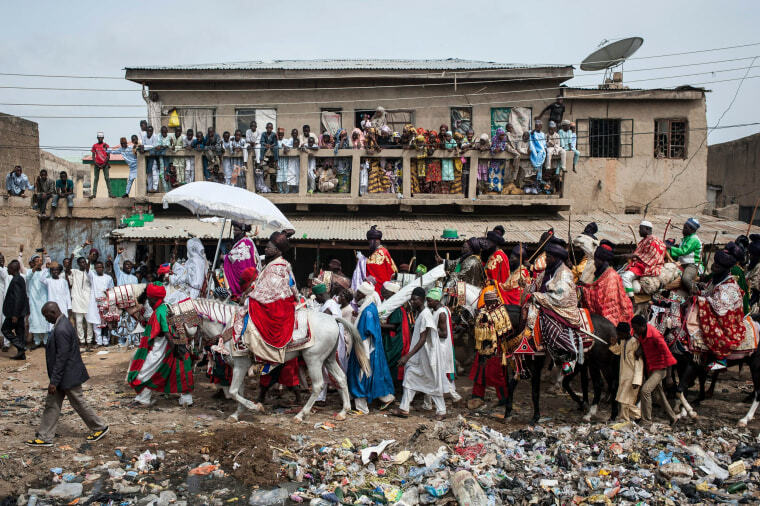 The Emir of Kano, Muhammadu Sanusi II, rides a horse as he parades with his entourage and musicians on the streets of Kano, northern Nigeria on July 6, during the Durbar Festival celebrating the Eid al-Fitr which marks the end of the Islamic holy fasting month of Ramadan. Families displaced as Iraqi forces battle against ISIS to retake the city of Mosul gather near Qayyarah, Iraq on Oct. 24. Iraq's second-largest city Mosul was once arguably the most multicultural place in Iraq, with a Sunni Muslim Arab majority but also thriving communities of Kurds, Shiites, Christians and Yazidis. Together, they had created Mosul's distinct identity, with its own cuisine, intellectual life and economy. 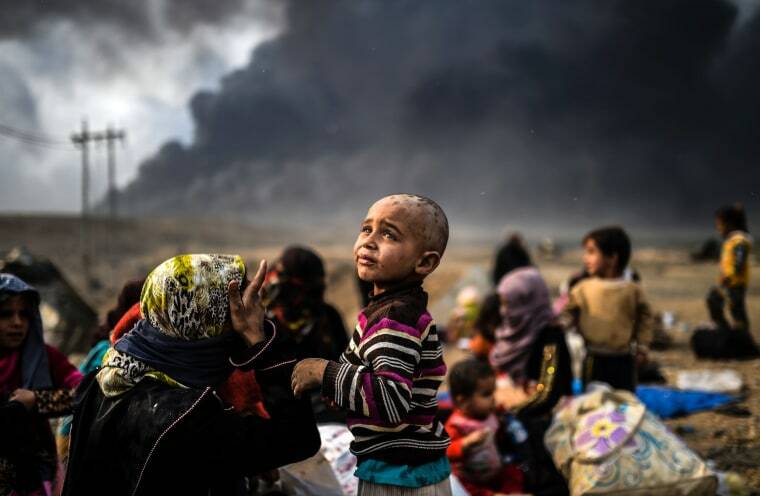 But ISIS has turned Mosul into a place of fear, hunger and isolation under 2 ½ years of rule by the militants. 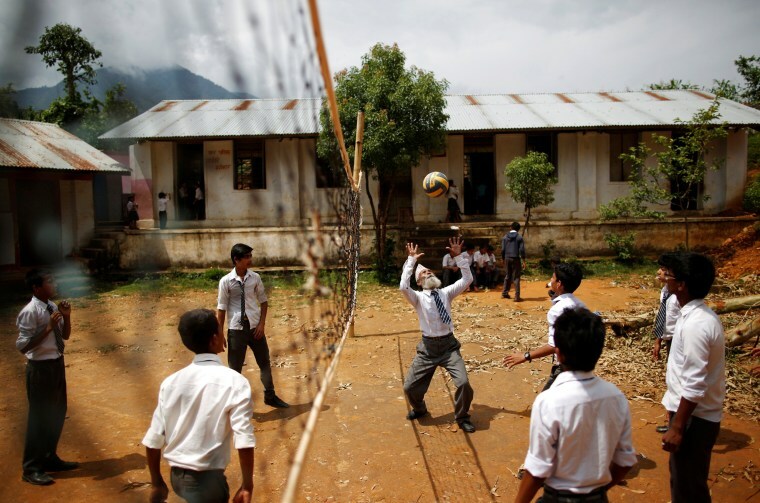 Durga Kami, 68, plays volleyball with friends during a break from classes at Shree Kala Bhairab Higher Secondary School where he is a student in the tenth grade in Syangja, Nepal. Poverty prevented Kami from finishing his studies as a child and achieving his goal of becoming a teacher. The father of six and grandfather of eight now goes to school six days a week to complete his studies and escape a lonely home life following the death of his wife. 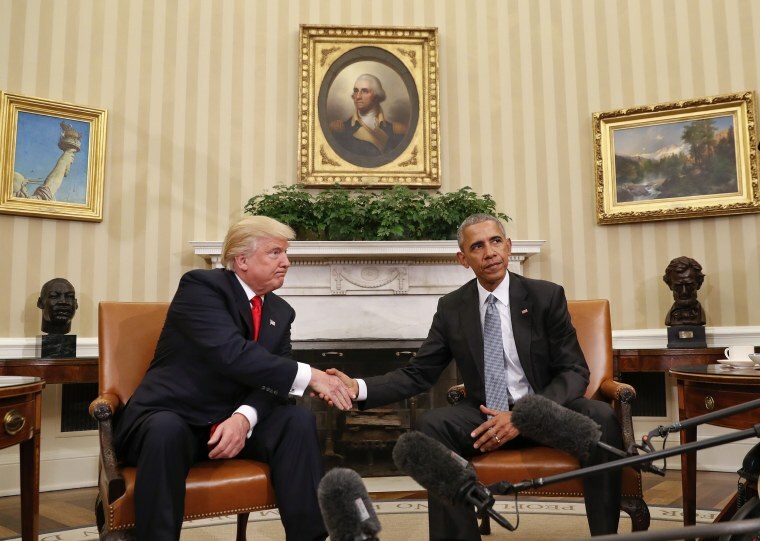 President Barack Obama and President-elect Donald Trump shake hands following their meeting in the Oval Office of the White House on Nov. 10. 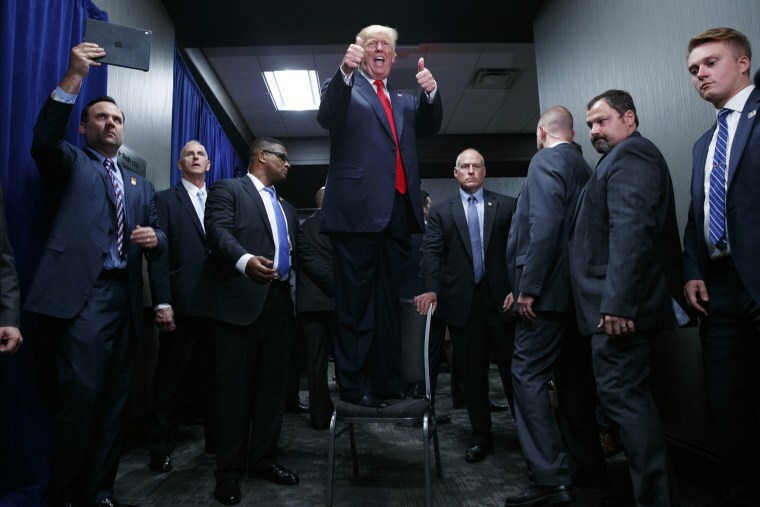 Donald Trump was elected president of the United States, as voters eager to shake up the nation's political establishment picked the businessman to lead the country. Trump's political inexperience allowed him to cast himself as a change agent just as frustrated voters in both parties were hungry for change. 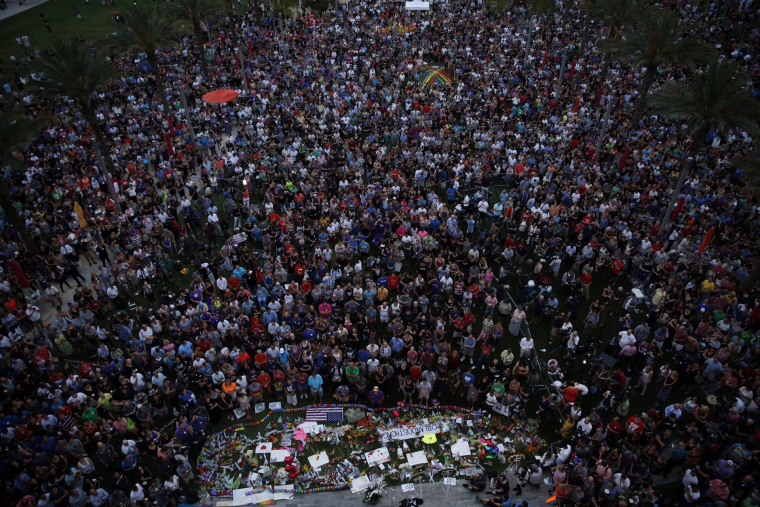 Mourners gather at a candlelight vigil outside of the Dr. P. Phillips Center for the Performing Arts in Orlando, Florida on June 13 to honor the victims of the mass shooting at the Pulse nightclub the day before. Forty-nine people were killed and dozens more were wounded after a gunman opened fire and took hostages at a LGBT-friendly nightclub. 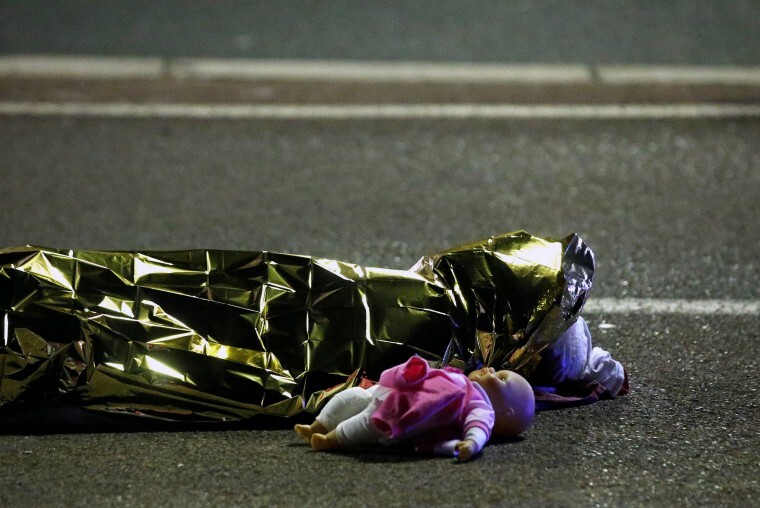 A body lies on the ground early on July 15 after a truck plowed into a crowd celebrating the Bastille Day national holiday. France was ravaged by its third attack in two years when a large white truck mowed through revelers gathered for Bastille Day fireworks in Nice, killing dozens of people as it bore down on the crowd for more than a mile along the Riviera city's famed seaside promenade. 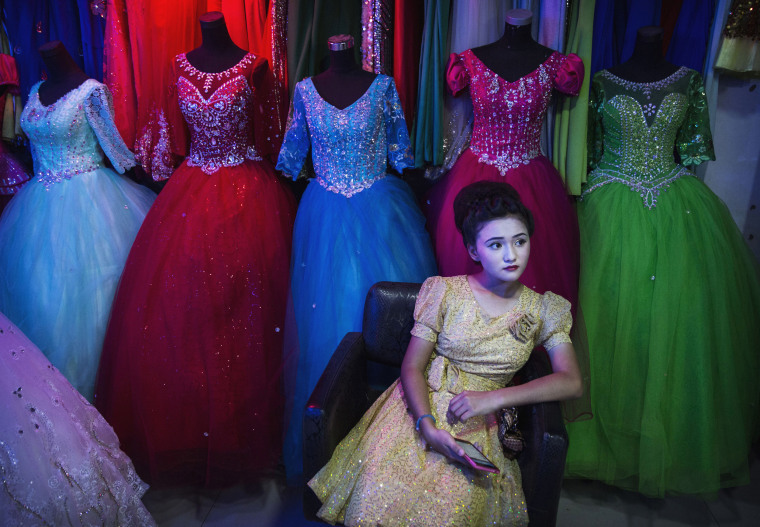 An ethnic Uyghur girl waits in a beauty salon to have her hair done before the Corban festival on Sept. 8 in Turpan County, China. The Corban festival, known to Muslims worldwide as Eid al-Adha or "feast of the sacrifice," is celebrated by ethnic Uyghurs across Xinjiang, the far-western region of China bordering Central Asia that is home to roughly half of the country's 23 million Muslims. Although Islam is a 'recognized' religion in the constitution of officially atheist China, ethnic Uyghurs are subjected to restrictions on religious and cultural practices that are imposed by China's Communist Party. Ethnic tensions have fueled violence that Chinese authorities point to as justification for the restrictions. A young man takes a shower at a water fountain in Houk, Haiti on Oct. 9. The rural area of Les Cayes was damaged when Hurricane Matthew stuck on Oct. 4, packing 145-m.p.h. winds. 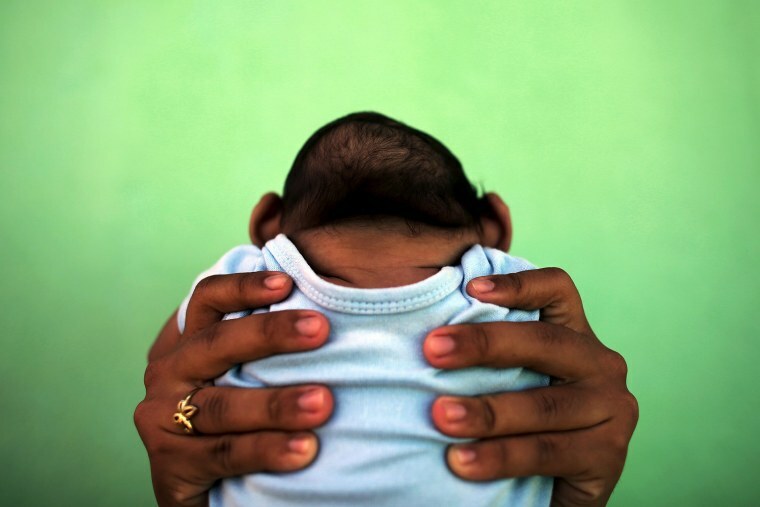 The Category 4 storm's center tore through the impoverished country's southwestern peninsula, killing killed at least 546 people and destroying crops and livestock that families depend on for survival. There is growing concern about food insecurity into 2017. People sit on their rooftop to get a better view as the remains of former Cuban President Fidel Castro pass by on their cross-country journey from Havana to Santiago de Cuba on Dec. 1 in Santa Clara. Castro, the revolutionary leader who brought communism to his island nation in 1959, died Nov. 25 at age 90. 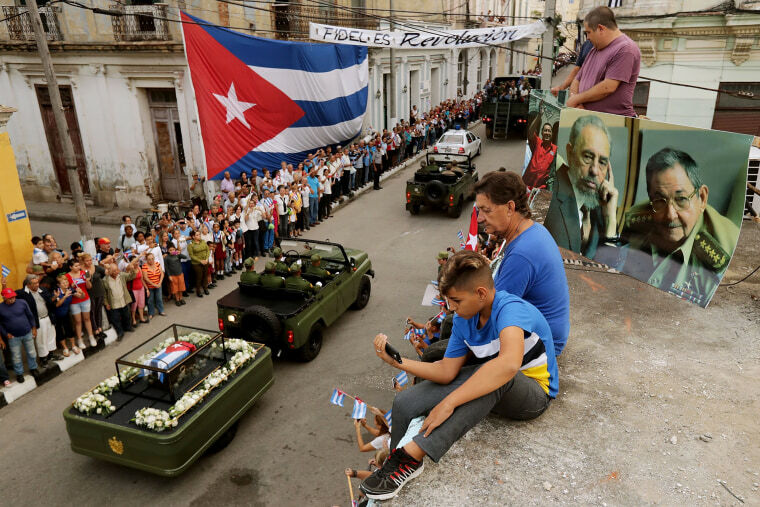 Tens of thousands of people lined the route, which retraced in reverse the path of the triumphant march of Castro and his rebels across the island to enter Havana on Jan. 1, 1959. Many waved flags and shouted "Long may he live!" 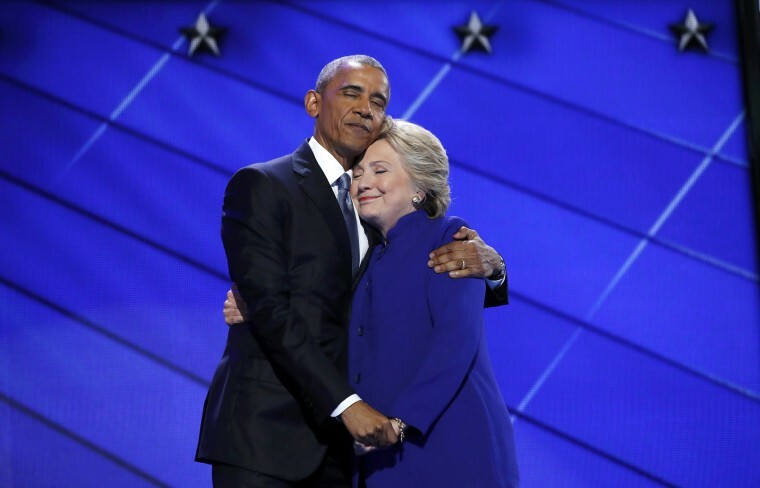 Clinton made history and became the first female presidential nominee of a major party, nearly a century after women gained the right to vote in 1920. 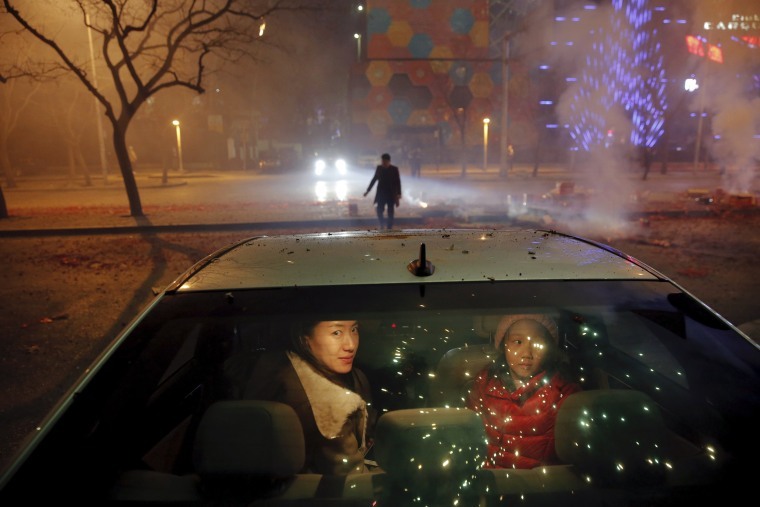 A woman and young girl sit inside a car as firecrackers and fireworks explode celebrating the start of the Lunar New Year of the Monkey in Beijing just before midnight on Feb. 7. A woman looks across as a gay parade participant poses for pictures in Madrid on July 2. Hundreds of thousands of people defied high temperatures and relative security concerns to march in the LGTB Pride parade, one of the biggest in Europe, along the streets of the Spanish capital. 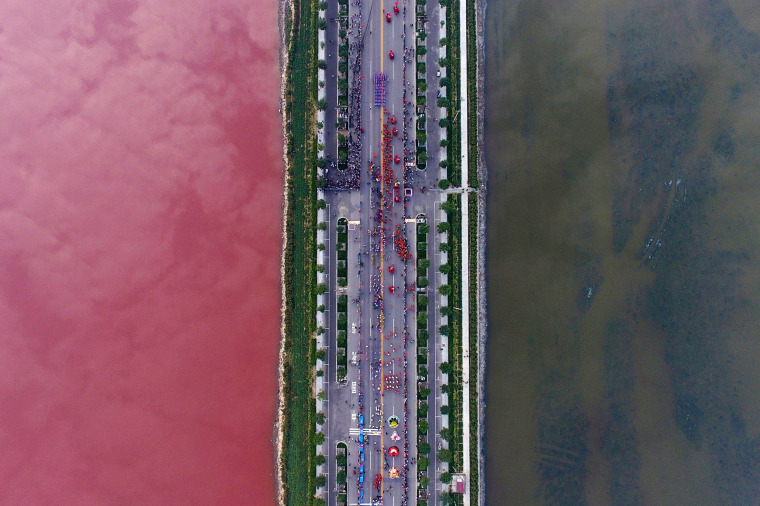 Algae changes the color of a salt lake, which is divided by a road in Yuncheng, Shanxi Province, China on Sept. 25. 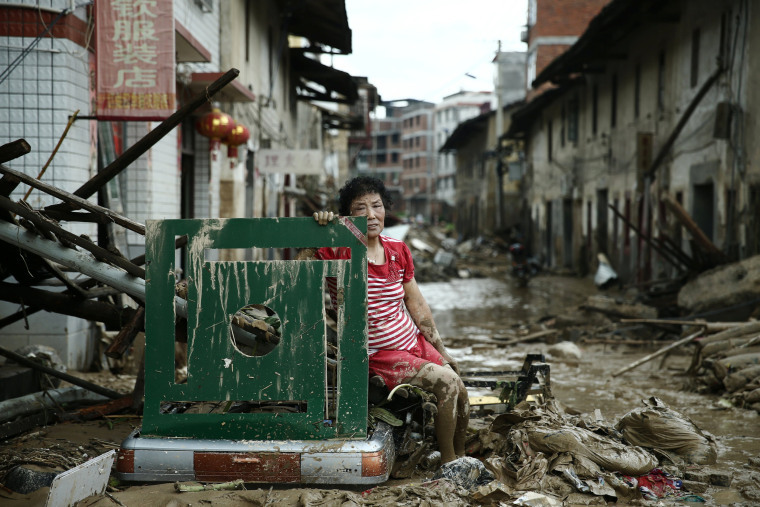 A woman sits on ruins after typhoon Nepartak swept through Minqing county, Fujian province, China on July 10. Typhoon Nepartak lashed the Philippines, Taiwan and China, leaving at least eight people dead and causing widespread flooding and power outages. Jennifer Molleda looks at the blood-speckled face of her husband, Alan Wakim, who had bullets whiz by his face after piercing his windshield during a shooting that left multiple people injured and the shooter dead on Sept. 26 in Houston. A disgruntled lawyer wearing military-style apparel with old Nazi emblems had two weapons and more than 2,500 rounds of live ammunition when he randomly shot at drivers in a Houston neighborhood before he was shot and killed by police, authorities said. Chicago Cubs players celebrate after defeating the Cleveland Indians in Game 7 of the World Series on Nov. 3 in Cleveland. 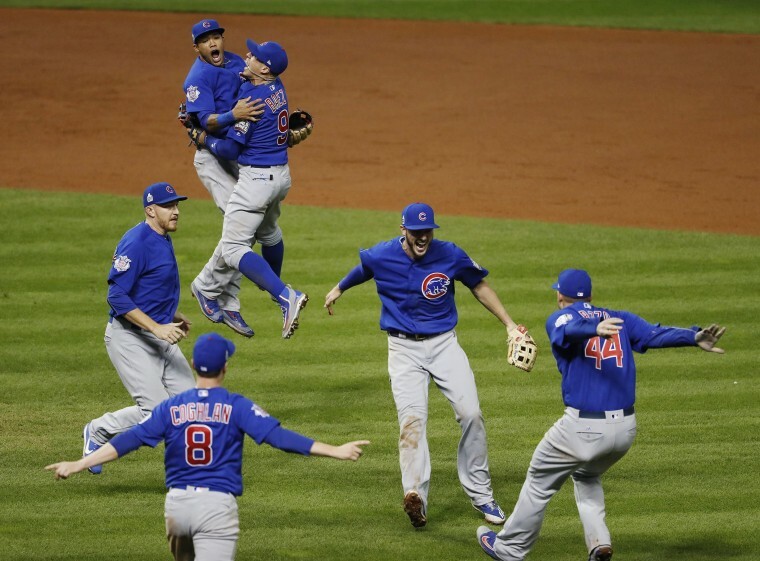 The Cubs defeated the Indians 8-7 in 10 innings for their first World Series championship in 108 years and ending the longest championship drought by any major American sports team. 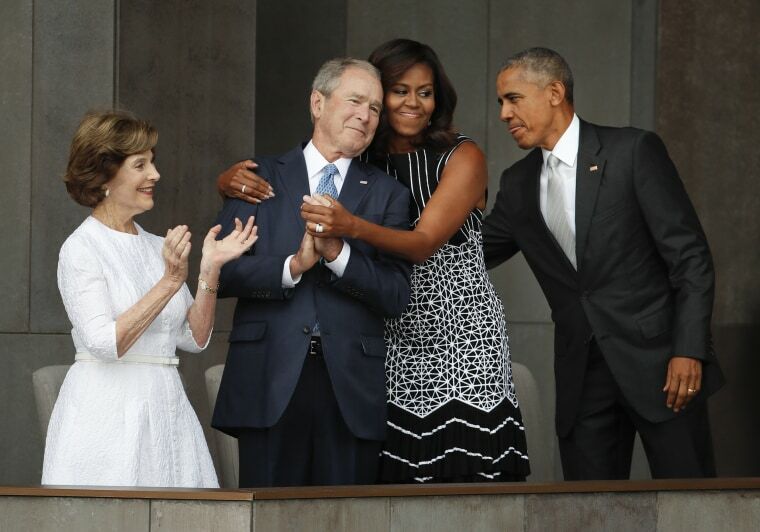 First lady Michelle Obama, center, hugs former President George W. Bush, as President Barack Obama and former first lady Laura Bush walk on stage at the dedication ceremony of the Smithsonian Museum of African American History and Culture on the National Mall in Washington on Sept. 24. The first national museum devoted exclusively to the history and culture of African-Americans opened in September. The push for the museum began in 1915 with African-American Civil War veterans looking for a way to commemorate America's black experience. Former President George W. Bush signed the law authorizing the construction in 2003. 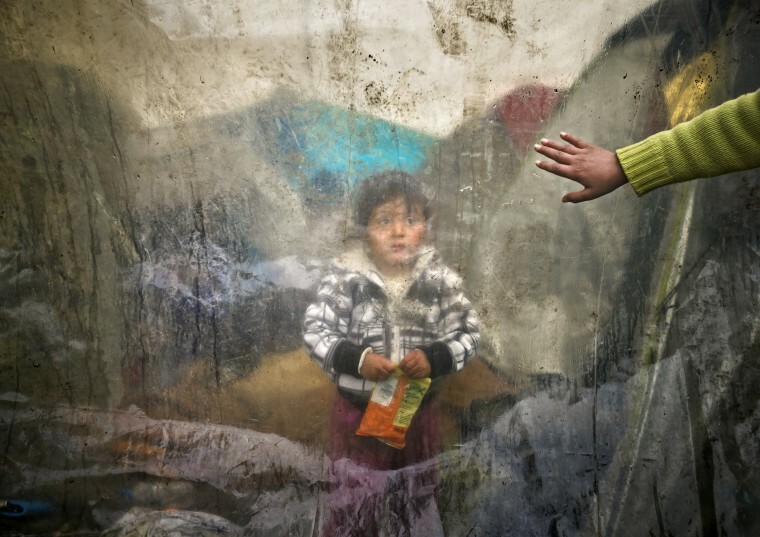 A migrant baby sits behind plastic sheets covering tents during a rainfall as a boy waves in a makeshift camp at the northern Greek border post of Idomeni, Greece on March 15. 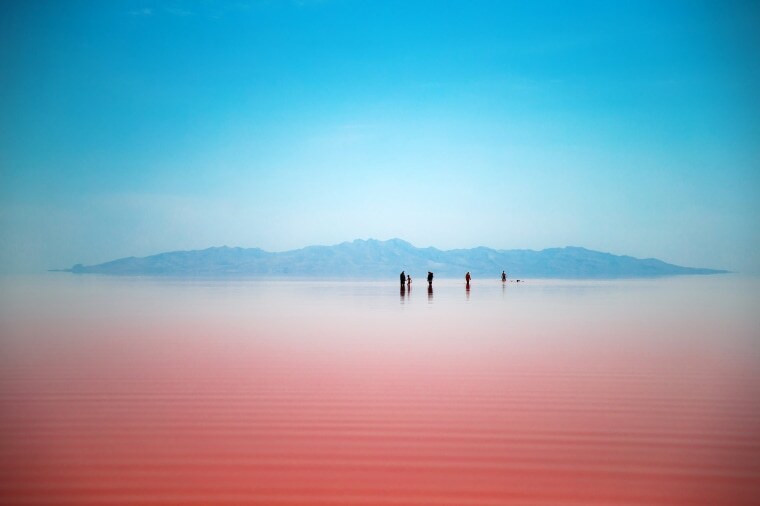 Iranians explore Urmia Lake in northwestern Iran Aug. 26. Hopes for the survival of the salt lake were revived after rainfall boosted a government program aimed at preserving the almost dried up water body.